Geoffrey Chaucer was born in 1343, to John Chaucer a vintner and deputy to the King. 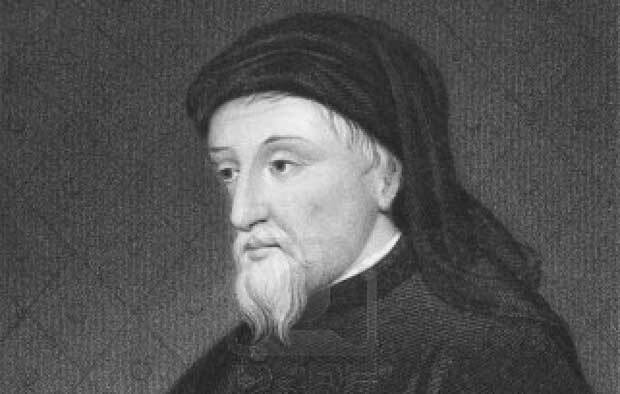 Chaucer, his family name is derived from the French word ‘chausseur’ meaning shoemaker. As Chaucer was a public servant his life is well known with five hundred of his writings as a witness to his remarkable career. Chaucer first came into the scene as a page to the noblewoman Elizabeth de Burgh, the Countess of Ulster. This gave Chaucer a chance to remain in the close courts circle where he stayed throughout his life. He became a courtier, a diplomat and also worked for the King later to become one of the greatest poets in history. Chaucer’s first major work was ‘The Book of the Duchess’, was a dirge for Blanche of Lancaster. Other early works by Chaucer were ‘Anelida and Arcite’ and ‘The House of Fame’. He wrote most of his work in a prolific period when he was working as a customs controller in London. These include ‘Parliament of Foules’, ‘The Legend of Good Women’ and ‘Troilus and Criseyde’. His most renowned work to this date is ‘The Canterbury Tales’. According to many, the reason for the huge success of ‘The Canterbury Tales’ is that it differed to other novels written in that time period. It is a collection of stories told by fictional pilgrims on the road to the cathedral at Canterbury. This book later helped shape English Literature. Chaucer’s works can be grouped into three periods mainly the ‘French period’, ‘Italian period’ and then the ‘English period’. His book ‘Troilus and Criseyde’ was written during the Italian period; we can tell by the Italian poetry in it. Whereas ‘The Canterbury Tales’ was from the English period attested by the English subjects, with lewd jokes and esteemed figures often being weakened with humor. Chaucer was also known as a translator. Some notable works translated by him include ‘Consolation of Philosophy’ by Boethius and ‘The Romance of the Rose’ by Guillaume de Lorris. He received a lot of critical praise as a translator. Chaucer had a continental accentual-syllabic meter. He is famous for his metrical originality. He is known to have invented the rhyme royal, and he was a pioneer of the five-stress line, a decasyllabic cousin to the iambic pentameter. This style was observed in his book ‘The Legend of Good Women’. Chaucer also wrote some humorous books, the first one being ‘The Reeve’s Tale’. Chaucer’s poetry is attributed to helping in standardizing the London Dialect of the Middle English language from a combination of the Kentish and Midlands dialects. The reason was probably being him influenced by the court and chancery. People nowadays have difficulty understanding Chaucer’s work due to the significant change in English language over the time. Geoffrey Chaucer is no doubt true to his title of ‘The Father of Literature’. He died in London on October 25, 1400. Chaucer was the first poet buried in Westminster Abbey, in the part of the church, which later came to be known as ‘Poet’s Corner’. A monument was erected as a tribute to his enormous contribution to English language.